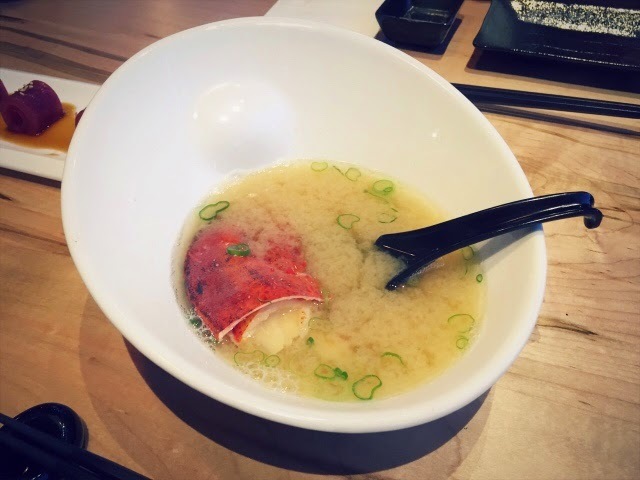 Nothing particularly special about the Lobster Miso Soup aside from the fact that there's a lobster claw in it. It would have been nicer if the miso soup was boiled with lobsters such that every of sip of the soup broth is laced with lobster flavour opposed to having to literally bite into the lobster to get it. In addition to the standard miso soup, the lobster itself was slightly dry. I would skip this appetizer. This is just your standard tuna carpaccio - but I did enjoy it. I did like the sauce and how it was slightly on the sour side. However, for the price, I wouldn't order it again as it was quite pricy and wasn't outstanding enough for the price ($2.67 + tax = $3.02 / piece). 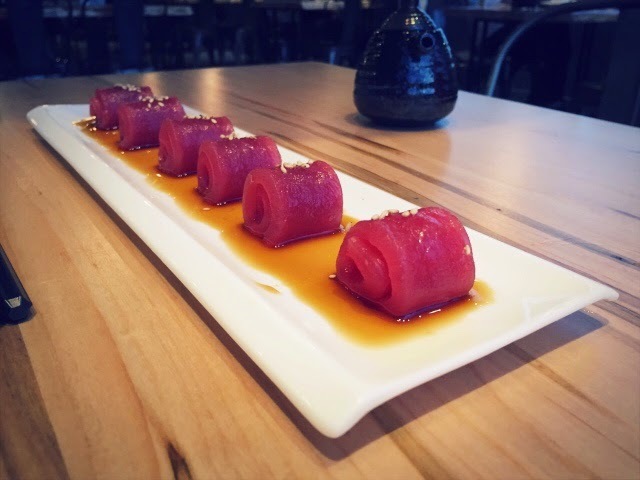 Traditionally, I've seen tuna carpaccio ordered at other restaurants with more garnishes - such as scallions, daikon crisps, or chopped green onions - in addition to sesame seeds. 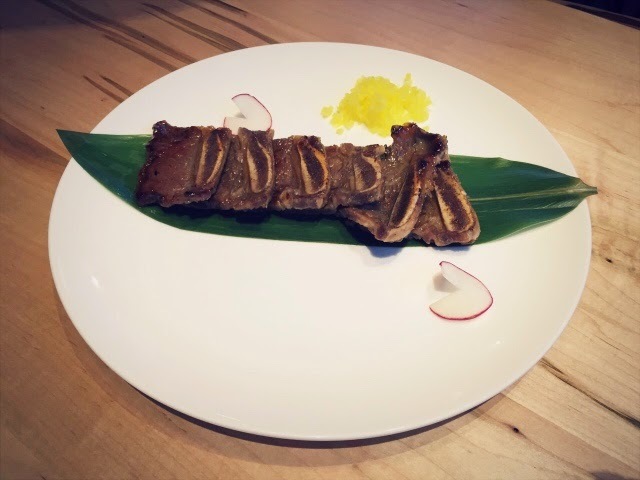 The beef short ribs were nice, and they were quite large ribs pieces. These had more flavour than majority of the dishes that was ordered. They were nice and buttery, but a little chewy. I would definitely recommend this over the tuna carpaccio for flavour and value. This is the first time I've ever seen avocado oshizushi and ordered it because I was quite intrigued by it. It was ok, but unfortunately, I was underwhelmed by it. The avocado flavour was overwhelmed by the mango/tangy sauce (which kind of tasted like salad dressing?) and there was too much bland, dry rice in each bite which superseded the avocado. 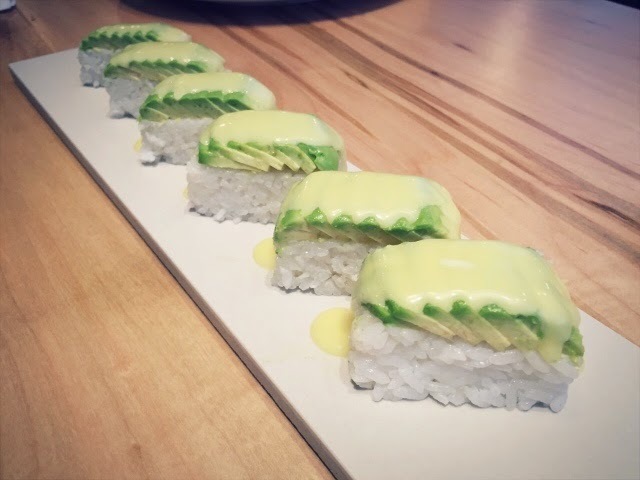 Considering that the entree is called "Avocado Oshizushi", it should be expected that avocado would be the "key" ingredient opposed to the sauce. I love avocados, but I wouldn't order this dish again. This was the main reason I decided to try out Le Modern Japanese Restaurant. 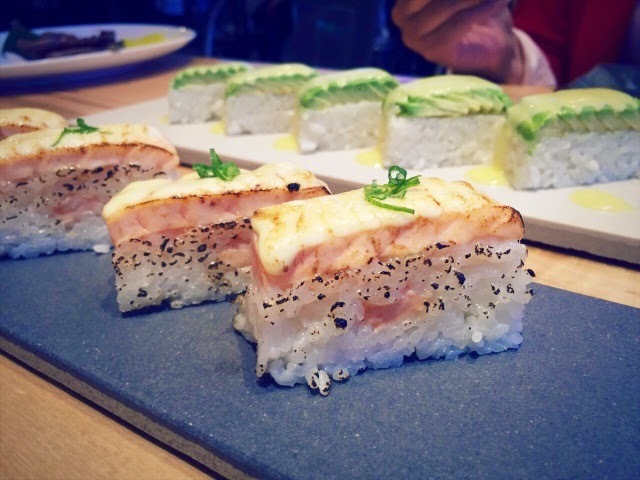 I was hoping for a Markham alternative to my favourite Japanese restaurant's, JaBistro, signature aburi salmon oshizushi. 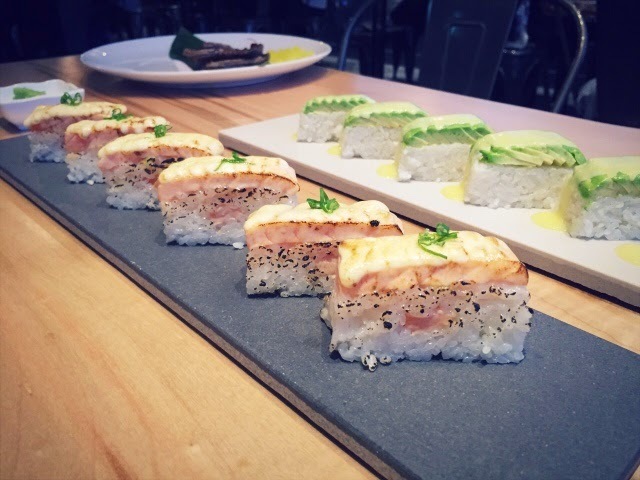 Although the salmon oshizushi was tasty, I still think JaBistro's aburi salmon oshizushi is better (especially for the price difference of $1). 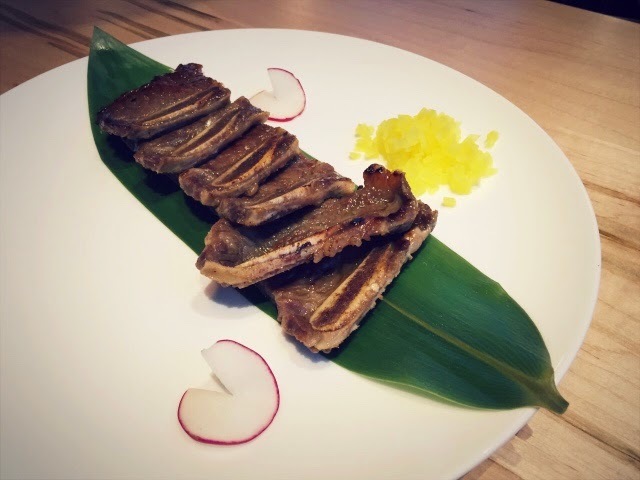 What separates Le Modern and JaBistro is that JaBistro tastes as though the entire oshizushi, including the moist rice, melts with flavour in your mouth. 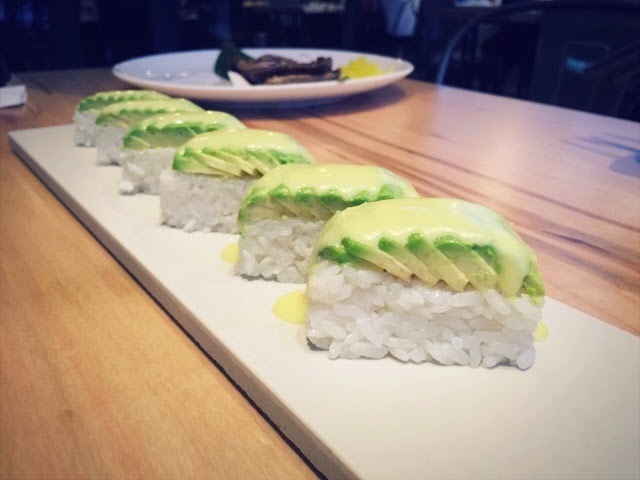 Similar to the avocado oshizushi, I feel that there is a lack of attention paid to the rice component. The rice is a little dry. The salmon can be delicious (like it was here), but the level of "umami" can be brought down by the dry rice component. Although it's never really the centre of attention, the rice component of oshizushi is just as important as the topping. I was interested in trying the carbonara udon as my all time favourite dish at Han Ba Tang is their Creamy Rice Cake, which is essentially carbonara sauce and Korean rice cake. Like the rest of the dishes that were ordered, it was alright. 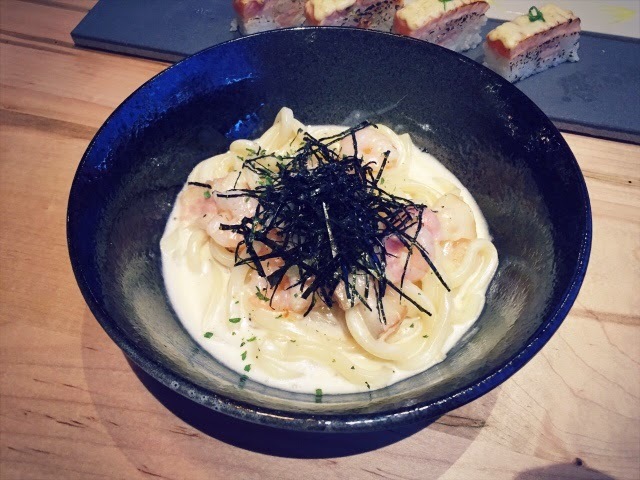 I felt that the carbonara sauce was a little heavy for the udon noodles and the shrimps tasted although they had been boiled in water and simply added to the dish after the udon noodles and sauce was plated. Overall, I felt that the dishes at Le Modern Japanese Cuisine were on the bare basics/simple side (perhaps even slightly bland?). However, because they are a newer restaurant I see plenty of room for improvement (so new that I couldn't even geotag my photo on Instagram!). The restaurant's ambience was quite relaxing and the wait staff was courteous. 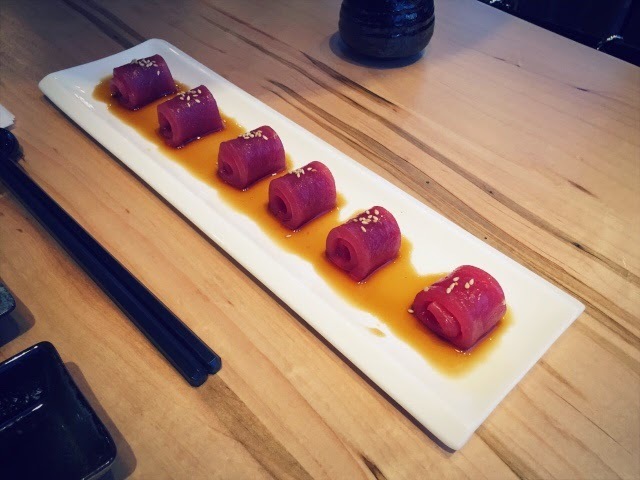 A small detail, but I also noticed that in all dishes that I ordered, pieces came in multiples of six. I did like the restaurant, but for the price point, I rather dine at JaBistro, Kingyo, Guu, Han Ba Tang, or Ten-Ichi (an all you can eat restaurant with decent salmon oshizushi). If the level of flavour improves, I would definitely return as it's location is much more convenient. Perhaps a second visit in a couple of months may prove me wrong.